Ice sheet model with variable resolution evaluates vulnerable regions of the Antarctic ice sheet. Antarctic vulnerability to localized ice shelf collapse. An ice sheet model sensitivity study identified the three ice shelves connected to West Antarctica as most prone to destabilization. 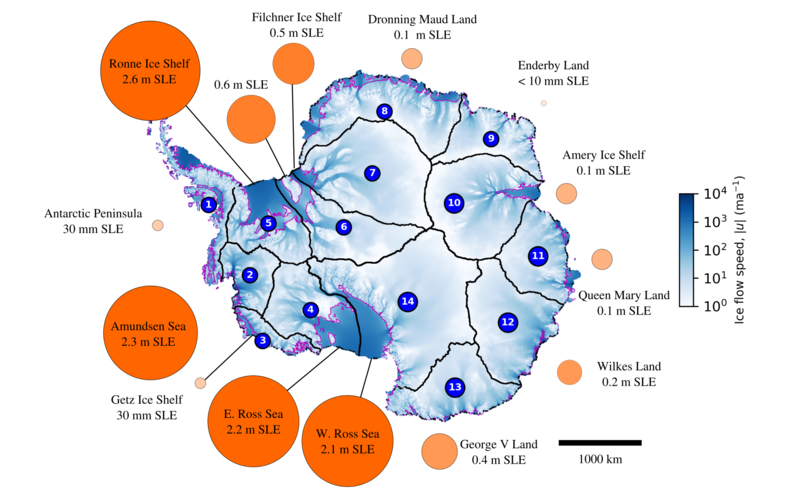 To better understand where the Antarctic ice sheet (AIS) is vulnerable to ice-shelf loss, a team of researchers led by Lawrence Berkeley National Laboratory, divided the AIS into 14 regional sectors, which roughly correspond to large-scale Antarctic drainage basins. Using their high-resolution (1km or finer) BISICLES ice sheet model, they applied extreme thinning rates to each sector's floating ice shelves in turn, then ran the model 1000 years into the future for each case. They found three levels of vulnerability. The greatest vulnerability came from destabilizing any of the three ice shelves connected to West Antarctica, where much of the ice sits on bedrock below sea level. Each of those dramatic responses contributed around 2m of sea level rise. The second level of vulnerability came from four other sectors, each with a contribution between 0.5-1m. The remaining sectors produced little to no contribution. They also examined combinations of sectors, determining that sectors behave independently of each other for at least a century.